Bankruptcy should always be a last resort (see our credit card debt section for credit card offers for bad credit). However, if you are determined to file bankruptcy but have not done so yet, then please take your time and don't rush the process - it is more important to ensure that all your bases are covered rather than to make a mistake that may cost you later. Obtain Credit Reports. You absolutely need to obtain your credit reports from the three major credit-reporting agencies (Experian, Equifax, and TransUnion). Fortunately, you can conveniently obtain all three credit reports online in only minutes. With the reports direct from each bureau you will have access to a file number and a phone number needed for accessing customer service. You will see the addresses for each creditor on the credit report. If it is not there, then you can call customer service to ask them to provide you with the missing information. When you call the bureau you can ask them to provide you with the phone numbers for each of the companies showing on the credit report. Get Updated Information. You need the most up to date information you can have when filing for bankruptcy. Call each creditor and ask them how much is owed and for the address where payment should be sent. If they don't handle the account, then ask them for the name and addressof the collection agency that will take payment. Call the collection agency and ask them how much is owed and for the address where payment should be sent. When dealing with creditors and collection agencies don't let them bully you or upset you over outstanding balances. Just collect the information you need. All you have to say is, "Thanks. I will call your company back soon regarding this matter." Don't give them time for a rebuttal - just hang up. If they push the matter, then only as a last resort tell them you will be filing bankruptcy. Give them the name and number of your attorney and end the call. Some companies will take this as a reason to step in and offer a settlement to reduce the amount owed in order to get you to pay. And sometimes people do call creditors and suggest bankruptcy just for this edge in negotiating a settlement, even when they don't intend to file. You absolutely don't want to use this tactic if you are going to follow through with the bankruptcy. They will try to default your bankruptcy petition if they can. Identify All Accounts. It is important to identify all of your accounts. If you don't see a creditor or collection agency on the credit report you know for a fact you owe money to, then you need to find any billing statements or collection letters you may have received. These statements and letters will have necessary address information and phone numbers along with amounts still owed. If you have no such information, then try to skip trace online to locate these companies. I personally like using this site for look up: bigbook.com. You don't have to know what city the company is located in, but definitely try to find the state. If that is still not helping, then you can also try the Better Business Bureau site. Make a list of accounts for your bankruptcy attorney. Your attorney will need the addresses, balances, and account numbers to complete the bankruptcy papers. If there are creditors that you want to continue paying, then it is very important at this time to tell your attorney that you want to offer reaffirming on the debt. The attorney will then send the offer to the creditors you have selected who must accept it. Then the judge must accept the offer too. The creditors will continue reporting the balance owed and show the status reaffirmed on your credit report. Once discharged then the balance will show as zero. The public record listing will remain 7 years from the file date. The accounts included in bankruptcy will remain on your credit report 7 years. Chapter 7. Once discharged then the balance will show as zero. The public record listing will remain 10 years from the file date. The accounts included in bankruptcy will remain on your credit report 7 years. For further information on reporting periods please review the Fair Credit Reporting Act at the Federal Trade Commission web site. Other recommended reading is the staff opinion letters regarding reporting periods. Usually prior to filing bankruptcy defaulted accounts go into collection or charge off status. The creditor stops reporting account information to the credit reporting agencies and turns the defaulted account over to a collection agency. The collection agency then picks up on the collection efforts and will from that point on report account information to the credit-reporting agency. The creditor is taken out of the loop. Because account information is now handled by collection agencies instead of creditors, by the time your attorney sends your creditors notice of the account being included in bankruptcy, it is typically no longer in their system to properly notify the Credit Reporting Agencies to update zero balance and include in bankruptcy status. File a complaint with the Federal Trade Commission. They regulate the Credit Reporting Agencies. File a complaint with your attorney generals office. File a complaint with the regulating company over each of the creditors. Your bankruptcy attorney can file complaints against creditors who do not report accurately. When creditors don't update account information with the credit reporting agencies, then you get an incorrect credit report that still shows you owe on the accounts in question, and that they are currently in collections or charge off status when in fact they are not. 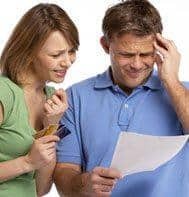 The problem with this is that if you apply for new credit after your bankruptcy is discharged, then you are likely going to be declined because the new lender will assume that you still owe on the debt. Obtain a copy of your bankruptcy and discharge papers from your attorney or the courthouse. This may include a copy fee. Make three copies of the section of papers that list all of the creditors and collection agencies that were included in the bankruptcy - usually this is called the Schedule F.
Forward these documents along with the discharge to all of the credit-reporting agencies (listed below) requesting that each creditor included in the bankruptcy be updated to properly reflect a zero balance with the status included in bankruptcy. Be sure when mailing correspondence to the credit reporting agencies to include a copy of your driver's license and mail certified return receipt requested . This will ensure disputes are processed with little delay. Finally, if you have a creditor or collection agency which is not honoring your bankruptcy and continuing collection efforts, then be sure to contact your bankruptcy lawyer.Give your lawyer the name and address of the company bothering you so that he or she can send them official notice. Follow up with the lawyer if the creditor persists in harassing you. It is a violation and they can be held accountable if they don't cease after notification of the bankruptcy. As with all consumer issues, knowing your consumer rights throughout the bankruptcy process is essential. Taking a proactive approach at the onset of the process will help you on your road to credit recovery.